When my family first came to America they settled in the warmth of the Virginia mountains. In those calm mountains they made a better life for their future generations. The love for those beautiful mountains flows in my veins. It is a desire for their presence that never leaves my soul as I wander the world in search of a peace I will not find out from beneath their shadows. In the hills, among the trees and cool night air, my mind finds itself a sense of being at home. The picture above reminded me of those Virginian mountains to which I'm so often drawn. In those old forest I see the warmth that first welcomed my ancestors to this land of the free. In those blue shadows I see the gentle peace that brought my family out of Europe's callousness. But I can't help but realize that despite the beauty of that picture there is something far different than freedom nestled in those mountains above. The picture above is of the mountains in Azad Kashmir. Just to the east of those peaks lay the line of control... a demarcation between Indian and Pakistan. It is one of the world's most militarized zones. It is a place on the planet that two armies stand and stare at one another as a war that officially ended decades ago waits for the spark to reignite it. Millions of men wait to die on both sides of the wire. Millions of innocent souls wait to be caught up in the crossfire. Kashmir is a land of lost beauty. Despite all the wonders it has to offer the world it is caught between three nations that make life impossible. Everything and everyone that remains between the three beasts does so with the constant reminder that death isn't far away. Every flower that blooms risk being savagely crushed beneath the heels of jackboots on their way to the next massacre. This is the irony of one of the world's most neglected lands... a paradise lost. China is in Kashmir as it is in Tibet, an opportunistic savage. There is no better way to describe the persistent pain that China has created in the eastern portion of Kashmir. Through aggression and refusal to cede land it never really had claim to, China has injected itself into India and Pakistan's war. The area of Aksai Chin was forcibly annexed when in 1956-7 the Chinese military moved their forces into Ladakh to build a road capable of moving military equipment south from Xinjiang province. The excuse that the world has accepted is that China wanted to provide better communication between Xinjiang and Tibet. However this is hard to explain outside the realization that China occupies both Tibet and Xinjiang through military might and has no real claim to either. The desire to annex Aksai Chin led to a short but nasty little war in which India's line of control was shifted. This once again divided up the Kashmir and placed yet again more families on opposite sides of the fence. Pakistan took the opportunity to antagonize it's rival to the south by handing over even more land claimed by India at the end of the war. This once again added another layer to the conflict ridden area. As for China the move to invade the region was something of an effort to create a buffer zone between it's Muslim population in Xinjiang and the Muslims of Pakistan and Afghanistan. This show of unpunished aggression allowed China the ability to make it's presence felt in the Muslim world. It showed the Uyghur Muslims that the state could and would use force to keep Xinjiang... and every last inch of it. This use of force is still reflected upon today as China pumps Xinjiang and Tibet full of military and security personnel. The road that launched the conflict is still utilized to maintain the buffer zone between Islamic ethnic minorities in China and the rest of the Muslim world. Even with the Internet and television weakening that physical barrier, China still maintains it's presence in Aksai Chin. Pakistan is often accused of inflaming the Muslim population of Kashmir with propaganda and anti-Indian messages. During the Soviet invasion of Afghanistan the Pakistani government was accused of providing Afghan Mujahadeen with passage into the Kashmir. This claim, mainly by India, was used to explain the influx of Kashmiri nationalism as the youth of the region became increasingly disenfranchised. Though there is a little truth to the allegations that Pakistan has provided some assistance to militant groups operating on the opposite side of the wire the reality of brutal Indian policies should be first blamed. Yet the claims still persist to this day. The desire to absorb the Kashmir in it's entirety and the refuse to allow the Kashmir to express it's right to self-determination has been Pakistan's main failure. Unlike China, Pakistan does not appear to want any such buffer zone left between their country and India. The desire to claim the land is further expressed through Pakistan's constant highlighting of the reality that the Kashmir is predominately Muslim. This shows Pakistan's desire to finish the bloody mess the British left behind when the Sikhs, Muslims, and Hindus were left to race toward their respective homelands (in which the Sikhs were left empty handed). This desire to force the Kashmir into Pakistan rule is not a new one. In 1947 the hellish fighting that ensued was a direct result of Pakistan's willingness to push it's will upon the Kashmiri people. The land had been left in a standstill as the rulers decided which country they wanted to join at the end of British rule. Pakistan sent in it's guerrillas to rush along the decision making process while India offered it's military to push back the Pashtuns. The war that followed was the exact reason that India now maintains a line of control and divides the Kashmir region with it's presence. Another result of the war is the Azad Kashmir district on the western edge of Kashmir. This strip of land is all that the Kashmir region has to show for it's first attempt at self-determination after the fall of British occupation. A sliver of land that echoes the mistakes of long dead men. Pakistan continues to antagonize the Kashmir people with promises of freedom. It shows the world one face while creating excuses for India's overreactions along the militarized line of control. Playing the victim, Pakistan attempts frequently to fly one flag while preparing to run up another. This toying with the fate of the Kashmiri people serves only to satisfy Pakistan's desire to rule the Kashmir region. It serves to keep the region in chaos as the Indian government shifts it's weight to maintain control. In this aspect the government of Pakistan seeks to inflict a death of a thousand cuts... biting the elephant ever so often just to keep it bleeding. As a result the Kashmiri people themselves pay for the callousness of Pakistan's actions. India's presence in the Kashmir region has little to do with protecting it's territory or the Hindu minority in the Kashmir state. It has mainly to do with taking what India views is rightfully it's own. When the British left the Indian government that took over was less than willing to recognize the right of Pakistan to exist. This meant that Bangladesh (then East Pakistan) was just as much a nuisance as Pakistan was to the newly founded India. These were all areas that the new nationalist felt rightfully belonged to the Indians themselves. After all, these were all lands that had historically been included in the Hindu realm of influence. Kashmir fell into the conflict that originated out of Britain's two state solution through the desire of India and Pakistan to segregate the states by religion. So despite India having no real reason to claim an area that was predominately Muslim, the new government took the opportunity to do just that. Disregarding the initial reason for two states, India took the first excuse that came along. When the Maharaja signed over their right to self-determination the Indian military flooded the Kashmir. In a war that threatened to engulf the entire region, the Indian pushed the Pakistani guerrillas out of the Kashmir. Then in a sign of things to come, India turned their guns on the Muslim civilians who they had been asked to protect. This was the initial excuse India used to invade the Kashmir. This was the first sign that India wanted to fulfill the promise of two states for two peoples of two different religions. An often hidden aspect of India's occupation of the Kashmir are the abuses that the Indian government inflicts upon the Kashmiri people themselves. This was best illustrated during Ramadan when the Indian government violently responded to what began as peaceful anti-Indian protest. This once again highlighted the tension felt by Kashmiri people as they coup with the back and forth between India and Pakistan. It also however demonstrated the methods used by India as it shifts it's weight to crush any opposition to it's dominance in Kashmir. 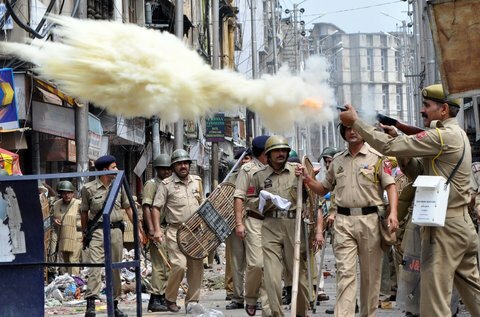 On Eid (the end of Ramadan) tensions flared between Hindus and Muslims as India began to crackdown on demonstrations against the government of India. In Jammu the violence became so incredibly dramatic that it overshadowed the Indian government's abuses across the Kashmir state. Curfews came into affect as the Indian security forces rounded up Muslims for what the state officially labelled "questioning". Those who continued to show passive resistance to the police state tactics were brought "under control" with violent force by the Indian military and police forces. What has followed can only be described as a blood bath. This heavy-handed response to Kashmiri challenges to Indian rule shows the world that India has no intention of allowing a peaceful path forward for Kashmiri peoples seeking independence. Though the original British mandate had indicated the right of the Kashmiri people to choose for themselves to which (if either) government they wanted to belong, India claims they made their choice. There is no room in India's resolve to admit that the Kashmiri people were forced into submission. There is no room for admitting that a bribe was all it took to crush the soul of a people. Just as with the Uyghur, whom China attempts to subdue through ethnic cleansing, the Kashmiri people will continue to seek a path toward self-determination. Without the right to decide their own fate as a people, as a nation, they will strive toward that end goal relentlessly. It is a condition in the human spirit that is undeniable and cannot be withheld from any people. It is the part of a nation's spirit that gave rise to countries such as India in the first place. And yet it is the portion of the Kashmiri story that has been withheld from the start. Britain, in all its mistakes, realized that it could no longer control the destiny of modern nations through military dominance. The empire that never saw the sun set fell because it refused to allow ethnic, religious, and cultural groups the right to determine their own path forward. It was for this reason that many of the areas that the Brits left behind are still in turmoil today. 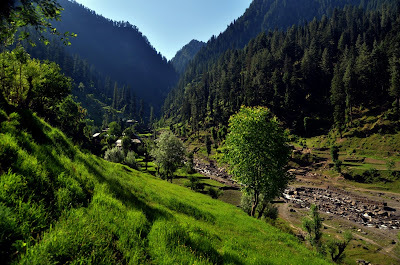 For Kashmir this hunger has devoured the beauty the land has to offer the world. The culture, the food, the knowledge; all are lost to war and greed. The beauty of it's mountains, it's people, and it's heritage; all are withheld as three beasts of nations continue to rip it's people apart. Want to learn more about this and other subjects covered by Alder's Ledge? The communist red chinese are the same savages the soviets are still today. They may call themselves democratic, but that's just a plain old lie. They are greedy pigs who pray on weaker nations nearby!